Like many of our social rituals, the marriage proposal has been defined and distorted by television. We’ve seen so many sit-com actors sinking to one knee, making an unbearably pompous speech bursting with painfully self-aware truisms and clichés, that it seems we're somehow obliged to emulate this theatrical behavior. If it’s on TV, it must be the proper thing to do, right? What could be less romantic than inappropriate actions and words in an inappropriate setting? Being nervous about proposing a lifetime of commitment is understandable, so why add pressure by doing it in a football stadium, a crowded restaurant, a public park, with brass bands, acrobats, dancing monkeys and the ring hidden in the pork chops or the fruit salad? This is all so painfully contrived and cringe-worthy that I wonder that anyone’s proposal is accepted and that more proposers are not shot on the spot for criminally embarrassing their prospective mate. Well, no actually. Couldn’t you tell by the shrinking back and the lack of enthusiasm for all your suggestions? At least he didn’t go down on one knee while driving. 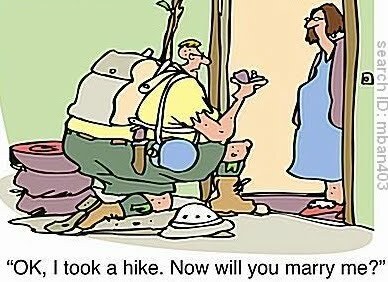 Of course, if you want to marry someone, it doesn't really matter how they ask you, but looking you in the eye with due solemnity will make a proposal more memorable and acceptable than any gratuitous hoopla with balloons and skywriting. Do all of your exes get unflattering nicknames? I found the whole idea of proposals excruciating, and was glad I never really had one. Martyn came bouncing off a plane with a ring in his pocket, shouting something about having a present for me. I think he had temporarily lost it somewhere mid-Atlantic when he was fidgeting. No, only this one has a nickname. "..bouncing off a plane with a ring in his pocket" sounds good. A proposal on a plane would be a horror if you had to turn him down, wouldn't it? I never had to face the task. My to be wife proposed to me by informing me in a pub one lunchtime in Chinatown, London, that her father was quite happy for us to marry. Did I have a choice? No. Bent knees? No. Splutter? Yes.